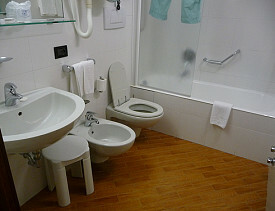 Most American’s have only seen a bidet (derived from the French word for pony) in hotel rooms in Europe and other parts of the world. Likely as not, most of those travelers did not actually give it a “test ride.” It’s not clear why the bidet isn’t as popular in America or Britain as it is in other parts of the world, however, many high-end hotels do install bidets for the comfort of their international guests. Pro-bidet communities feel it’s the ultimately in cleanliness and sanitation and foe-bidet forces believe it to be less sanitary than the standard use of toilet paper. Interestingly, it’s the environment that is bringing the bidet into more common usage, and the use is apparently growing. According to Treehugger.com, “We use 36.5 billions rolls of toilet paper in the U.S. each year, this represents at least 15 million trees pulped. This also involves 473,587,500,000 gallons of water to produce the paper and 253,000 tons of chlorine for bleaching purposes. The manufacturing process requires about 17.3 terawatts of electricity annually. Also, there is the energy and materials involved in packaging and transporting the toilet paper to households across the country.” One might ask if the extra water used by a bidet is environmentally worthwhile, however, the numbers above seem to answer that question. Today’s toilet and bath fixture manufacturer’s are producing more and more bidets (both the standard separate fixture and those integrated with the toilet) than ever before and advances in technology are making them more accessible, and acceptable, to the vast American buying public. Kohler is producing a line of bidet’s and faucet fixtures for the bidet that integrates with their standard bath fixture lines. Their C3 line of toilets features integrated bidet functionality into the seat of a standard toilet. Water and seat temperature are controllable, as is water flow and direction. Design’s bad boy Phillipe Starck has designed a functional toilet/bidet for Duravit that combines his signature streamlined design style with true functionality. The Sensowash Shower Toilet Seat Starck features an oscillating wash, remote control and self-cleaning capability. Toto’s Neorest 600 is a traditional stand-alone bidet that offers a warm air dryer to the standard mix of bidet features, a remote control and full sanitizing features. Bidet’s aren’t just for the designer bathroom fixture set. The Simplet, available at Biobidet.com, is a simple low-tech snap on bidet seat that will fit most standard toilets. For $50, it offers adjustable water pressure and a hand held nozzle for easy direction.